[컴퓨터월드] 최근 통합관제시장은 기존 IT인프라와 시설물 관제를 넘어 에너지관리, 재난 방지, 교통 상황 예측, 제조 부문 생산 관리 등으로 그 영역이 대폭 확대되고 있다. 관제의 개념이 바뀌고 있는 것이다. 최근에는 빅데이터를 분석하고 여기에 관제 기술이 결합된 빅데이터 관제, 비즈니스 관제라는 새로운 개념의 관제시장이 열리고 있기도 하다. 국내는 물론이고 세계적으로도 큰 이슈가 되고 있는 에너지 분야에서도 관제에 대한 관심이 높다. 정부는 물론 각 기업에서 에너지 효율화 방안 도입 필요성이 대두되면서 유지 관리 비용 축소, 내구연한 예측을 통한 최적의 교체주기 파악 등 관제의 필요성이 강조되고 있는 것이다. 이런 이유로 데이터처리 및 사물인터넷(IoT) 기술을 적용한 제품의 다양화로 에너지 최적화 시스템 관리 시장도 빠르게 성장하고 있다. 실제 공공기관 및 주요 건물 에너지 사용제한에 대한 기준이 강화되면서 에너지 최적화, 예측 기술의 수요가 크게 증가하고 있다. 위엠비는 지난 10년간 관제 분야 1위의 경험으로 비즈니스 시스템(Business System), IT 인프라스트럭처(IT Infrastructure), 센서(Sensor) 기술에서부터 IoT까지 다양한 관리 대상으로부터 데이터를 수집/통합해 시각화하고 원인을 분석해 결과를 예측하는 등 고객에게 이상적인 해답을 제시하고 있다. WeMB의 Technology&Experience를 제공하기 위한 CoE(Contents Of Everything)를 알아보고 해당 위엠비 솔루션을 소개한다. CoE(Contents Of Everything)는 비즈니스 시스템(Business System), IT 인프라스트럭처(IT Infrastructure), 센서(Sensor) 기술을 통한 IoT까지 엔터프라이즈 내에 있는 다양한 관리 대상으로부터 데이터를 수집/통합해 시각화한 다음 원인을 분석하고 결과를 예측해 고객에게 이상적인 해답을 제시하는 비즈니스 가치 창출의 WeMB Technology&Experience이다. 아래 소개된 제품은 CoE 관점의 통합관리를 위한 위엠비 대표 솔루션들이다. 다양한 대시보드(데이터 시각화) 디스플레이 표시 구성이 가능하다. 하나의 디스플레이 화면에 다중 페이지 표시는 물론 단일 디스플레이 상에서 페이지 순환(롤링) 표시를 할 수 있다. 또한 용도/업무별 상황판 구성 및 토폴로지(Topology) 상황판 구성을 통해 대시보드 정보의 연관된 해석이 가능하다. 웹 브라우저를 통해 전체 기능을 제공할 수 있다. 또한 사용자/운영자 컴퓨팅 환경에 영향을 받지 않는다. 추가 프로그램을 설치할 필요가 없고 WAS 수정만으로 업그레이드 및 변경이 가능하다. 통합 관제 체계 구축을 통해 IT 인프라 관리 대상의 효율적 운영 및 선진화된 프로세스 기반의 관리 체계를 마련할 수 있다. 효과적인 정보 인지를 위한 데이터 시각화 및 다양하고 직관적인 효과를 제공한다. 시스템 / 서비스 관점의 정보를 구성하고 사용자 조작 및 정보의 중요도, 사용자 정의 시나리오에 따라 동적으로 반응한다. 사용자 편의성 및 기능 확장성, 유지보수 편의성을 보장한다. 컴포넌트 기반의 에디터를 통해 코드 변경 없는 편집 기능을 제공한다. 산업 분야별 패키지 플러그 인 아웃(Plug In/Out) 방식을 지원해 모든 산업 분야에 적용할 수 있다. 산업 분야별로 최적화된 시스템을 구축할 수 있다. 센터 내 개별적인 IT 자원 관리 체계를 통합하고, IT자원의 효과적인 운영을 위해 Real-View를 제공하는 입실론(IBSilon)은 자동화된 관리 환경을 기반으로 현장 대응이 가능하며, 현장 대응에 준하는 신속한 원격 대응의 효과를 기대할 수 있다. 입실론은 또한 기존 보유하고 있는 포인트 솔루션(Point Solution)과 연동해 2D기반의 뷰(View)를 Real-Time Full 3D로 개선해 각종 이벤트(Event)를 효과적으로 디스플레이(Display)한다. 웹 브라우저를 통헤 모든 기능을 제공하며 사용자와 운영자의 컴퓨팅 환경에 영향을 미치지 않는다. 추가 프로그램을 설치할 필요가 없고 WAS 수정만으로 업그레이드 및 변경이 가능하다. 기업운영 환경에 있어서 공통의 직관성을 확보하고 모든 사용자가 이해할 수 있는 일반적인 콘텐츠 구성 및 비즈니스 관점의 시각화는 물론, 다른 전문 정보간의 이해도를 높여 운영 관리 및 연관 정보의 분석이 가능하다. 담당 전문가들 사이의 소통 기반을 마련하고 운영적 의사 결정 및 전사 전략 경영 지원을 위한 새로운 가치를 생성할 수 있다. 분산되고 전문화된 단위 관리 솔루션(단위 포인트 솔루션)의 중앙 집중화된 관리 및 신속한 의사 결정을 위한 운영의 단일 접점 창구 역할을 할 수 있다. 대시보드(데이터 시각화)의 디스플레이 표시 구성을 다양화 할 수 있다. 하나의 디스플레이 화면에 다중 페이지를 표시하고 단일 디스플레이 상에서 페이지 순환(롤링)표시 등이 가능하다. 또한 비즈니스별 상황판 구성 및 토폴로지(Topology) 상황판 구성을 통해 대시보드 정보의 연관된 해석이 가능하다. 등록 키워드 및 대상 웹 정보를 크롤링해 수집된 주요 뉴스 및 SNS 데이터기반의 새로운 비즈니스 가치를 생성한다. 엔터프라이즈 IoT 관리 솔루션인 RENOBIT은 다양한 산업의 IoT 관리 분야에 적용할 수 있다. 300개 이상의 IoT 관리 분야별 지표를 제공하고 IoT 센서(Sensor), Actuator와의 인터페이스를 통해 데이터를 수집하고 통제함으로써 다양한 엔터프라이즈 업무환경과 통합할 수 있다. [Computerworld] Recently, in the integrated control market, its domain has been expanded to energy management, disaster prevention, traffic estimation, and production management in the manufacturing sector, transcending its existing IT infra and facility management. The concept of management is changing. Lately, control markets with a new concept such as big data control, which analyzes big data and integrates control technology to it, and business control, have been opened. Interest towards control in the energy sector, which is becoming a big issue not only domestically, but even at the international level, has been heightened. As the need to introduce ways for energy efficiency is raised to each corporation as well as the governments, the need of control such as slashing maintenance expenses, and identifying the optimized replacement cycle through the prediction of a life span has been emphasized. For such reasons, due to the diversification of products to which data processing and Internet of Things(IoT) technology are applied, the market for energy optimization system management has also been growing fast. As the standards with regard to limiting energy usages in public organizations and major buildings have been reinforced, demands for energy optimization and estimation technology have greatly increased. Based on the experience of being number 1 in control field for the past 10 years, WeMB presents ideal answers to the customers, by collecting/unifying the data from various management subjects from Business System to IT Infrastructure, Sensor technology, and IoT, and visualizing, analyzing the causes, and predicting the outcomes of them. We will take a look at CoE(Contents of Everything) to offer WeMB's Technology & Experience, and introduce such WeMB solutions. CoE(Contents Of Everything) is Technology & Experience of WeMB that collects and unifies data from various management subjects within an enterprise through Business Systems, IT Infrastructures, and IoT via Sensor technology, visualizes them, analyzes causes, predicts results, and then offers an ideal answer to customers for creating business values. Products introduced below are key solutions of WeMB for unified management in the viewpoint of CoE. 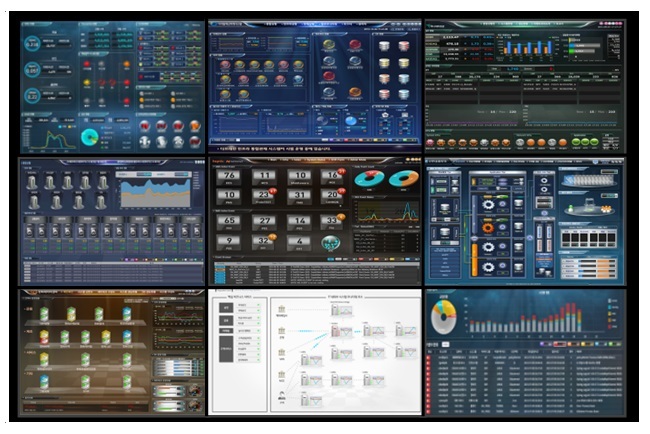 Making various dashboards(data visualization) display marks is possible. You can display multiple pages on one display screen as well as a page circulation (rolling) mark on a single display. Also, it is possible to do correlated interpretation of dashboard information through dashboard configuration for each purpose / work as well as topology dashboard configuration. It can offer a complete set of functions via a web browser. Also, it is not affected by computing environments of users / operators. It has no need to install additional programs, and can upgrade and change by modifying WAS only. It can establish management systems based upon effective operation of IT infra management subjects and advanced processes through the building of unified management systems. 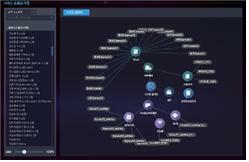 It offers data visualization as well as diverse and intuitive effects for effective information recognition. It composes information in the perspective of systems / services and dynamically reacts in accordance with user maneuvering, information importance, and user-defined scenarios. It can be applied to all industry domains as it supports package Plug In /Out way for each industry domain. It can build optimized systems for each industry domain. IBSilon, which unifies silo IT resource management systems inside a center, and offers Real-View for effective operation of IT resources is capable of reacting in the field based upon automated management environments. Effects of expedited remote responses equivalent to the field responses can be expected. IBSilon also effectively displays various events by linking to the existing Point Soultions to improve 2D-based views to Real-Time Full 3D. It secures common intuitiveness in enterprise operation environments, constructs general content that all users may understand, and visualizes business viewpoints. It is also possible to analyze operation management and related information by enhancing the level of understanding amongst different specialized information. It lays a ground for communication amongst professionals of each area in charge and can create new values for the operational decision-making as well as an enterprise-wise strategy management support. It can perform centralized management of distributed and specialized unit management solution (unit point solution), and play a role as single point of contact window. You can diversify the display configuration of dashboards (data visualization). You can display multiple pages on one display screen as well as a page circulation(rolling) mark on a single display. Also, it is possible to do correlated interpretation of dashboard information through dashboard configuration for each business as well as topology dashboard configuration. It crawls registered keywords and corresponding web information and creates new business values based upon collected major news and SNS data. 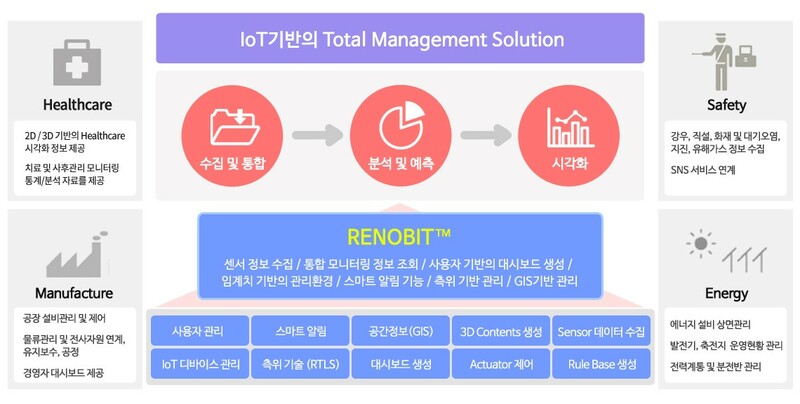 RENOBIT, an enterprise IoT solution, can be used to the IoT management domain of various industries. 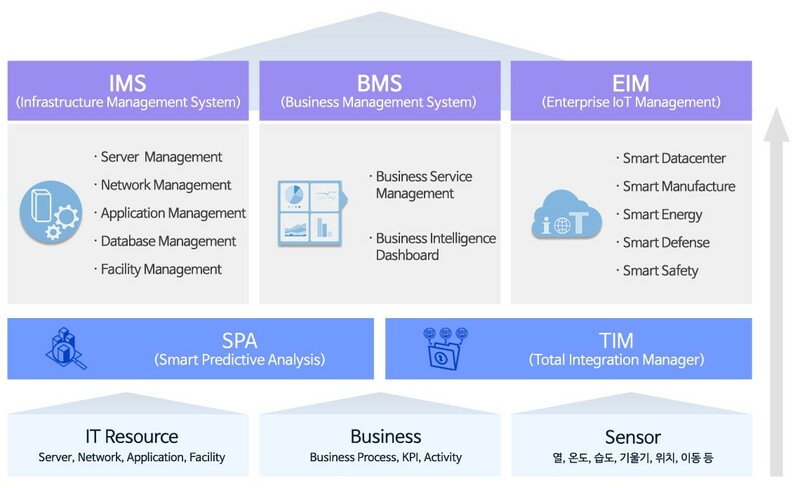 It offers more than 300 indicators for each IoT management domain, collects and controls data through interfaces to IoT sensors and actuators, to be integrated to diverse enterprise work environments.